The best gift for the beginning gardener or for the seasoned gardener who wants to grow better is, in my opinion, a good book. Among my favorites are any of Elliot Coleman’s books about vegetable gardening, any of Michael Dirr’s books about trees and shrubs, Steven Still’s Manual of Herbaceous Plants, Hartmann & Kester’s Plant Propagation: Principles and Practices, my bible on plant propagation, and, for general gardening, Roy Biles’ The Complete Book of Garden Magic and Barbara Damrosch’s The Garden Primer. For entertaining and informative essays, there’s Green Thoughts: A Writer in the Garden by Eleanor Perenyi and The Principles of Gardening: A Guide to the Art, History, Science, and Practice of Gardening by Hugh Johnson. This entry was posted in Books and tagged Barbara Damrosch, Elliot Coleman, garden cart, garden gifts, Michael Dirr, pitchfork, seeds, Steven Still, string. Bookmark the permalink. Trackbacks are closed, but you can post a comment. 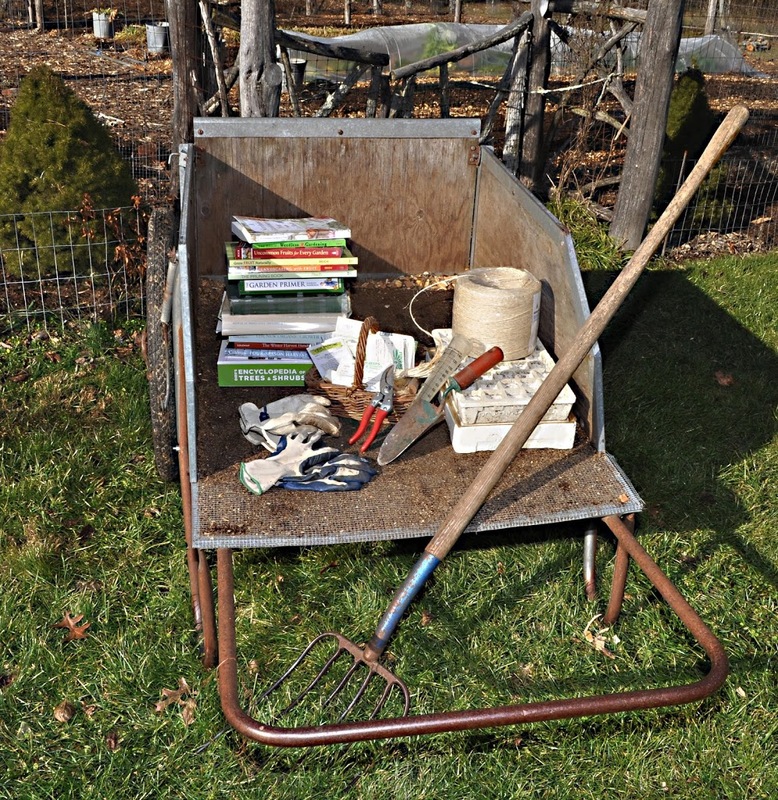 Excellent gardeners’ bibliography, but I would have put your “Weedless Gardening”, at the top and included your “The Pruning Book” shortly thereafter. I’d also hesitate to recommend most of Coleman’s works to a new gardener, but he definitely belongs in any serious gardener’s library. And there are a couple here that are new to me that go right on my wish list. Thanks! I am blushing. Thanks so much for your kind words. Great post! I would like to add the Crabtree & Evelyn Gardener’s Hand Therapy Lotion on your list of gifts for gardeners. it is made from soothing ingredients like shea butter, calendula, clover, and yarrow. It would give gardeners the smooth feeling after a hard day work. I make my own lotion by heating together olive oil and beeswax. I proportion it to be solid at room temperature. The heated, liquid mix is poured into a PVC tube having a bottom cap; when it cools, I push it out and cut the cylinder into rounds, which I put into metal containers (just like the commercial stuff!). It’s great for gifts.